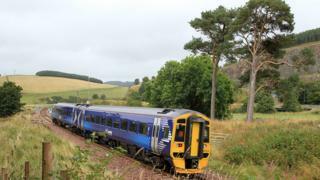 The "great benefits" of extending the Borders Railway have been recognised by the prime minister. Theresa May was responding to a question by Berwickshire, Roxburgh and Selkirk MP John Lamont about support for the Borderlands Growth Deal. Among the issues it is looking at is the feasibility of taking the line beyond Tweedbank to Carlisle. Ms May said the UK and Scottish governments would continue to work together to deliver the growth deal. Mr Lamont said: "The prime minister will be aware of the campaign to extend the Borders Railway from Tweedbank to Hawick, Newcastleton and on to Carlisle. "This will provide a huge boost to the local economy and will help demonstrate what Scotland's two governments can do for my region. "So what will the PM do to ensure there is sufficient resource in the Borderlands Growth Deal to allow this project to move forward?" Ms May said she was aware of the significance of the scheme. "I understand the importance to partners across the region of the campaign and the proposal that he has referred to," she said. "I am sure he understands this is a devolved transport issue. "But I would certainly encourage all parties that are involved to come to a workable solution and to ensure the best outcome for the entire region because this can bring great benefits." She added that both governments would "continue to work in partnership" to deliver the Borderlands Growth Deal.